Embattled former cyclist Lance Armstrong is making headlines again this week after documents published in USA Today reveal that most of Armstrong’s inner circle knew about his years of doping. The answers were provided by Armstrong during testimony for a lawsuit filed by Acceptance Insurance Agency, who sued the cyclist for fraud following evidence that the former Tour de France champ had cheated with performance enhancing drugs. In the documents, Mellow Johnny himself throws quite a few members of his inner sanctum under the proverbial bus. First, he points fingers at his trainer, Pepi Marti, and Drs. Pedro Celaya, Luis Garcia del Moral and Michele Ferrari for at one time paying for Armstrong’s performance enhancing drugs. He also goes on record saying that his masseuse, Emma O’Reilly, as well as Phillipe Maire and Julian de Vriese were all guilty of delivering the drugs to the cyclist on one or more occasion. Armstrong would not say if ex-wife Kristin Richard (they divorced in 2003) knew about the doping, citing spousal privilege. It has, of course, been previously revealed that Armstrong’s ex-girlfriend Sheryl Crow, whom he dated after his split with Richard, did witness his performance enhancing practices. 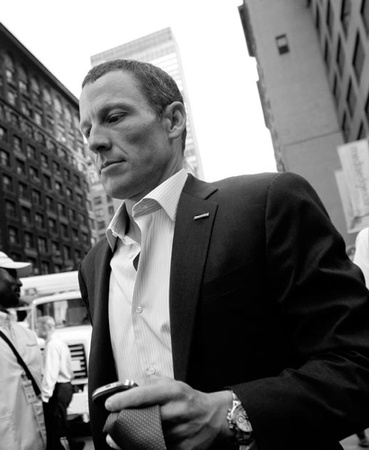 Over the last few years, the revelations about doping’s far-reaching effect on professional cycling has undermined the sport, a sentiment echoed by Armstrong in the documents. “Several of Armstrong’s teammates have submitted sworn affidavits in several proceedings admitting, or have otherwise publicly confirmed, that they used PEDs [performance enhancing drugs] between 1995 and 2005… Based on observation, and because the use of PEDs was so prevalent within professional European cycling between 1995 and 2005, Armstrong believes that most of his teammates (and competitors) were regularly using PEDs or other banned methods including, but not necessarily limited to George Hincapie, Floyd Landis, Christian Vande Velde, Jonathan Vaughters, Levi Leipheimer, Michael Barry, Tyler Hamilton and David Zabriskie. Armstrong eventually reached a settlement with the Nebraska-based insurance company. The company was seeking to recoup a series of bonuses it had paid cyclist following his Tour de France wins.